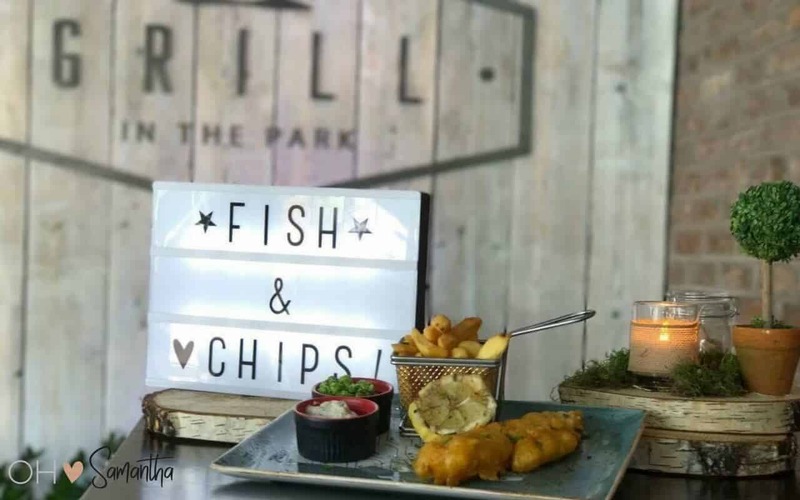 I was recently invited to sample the new dinner menu at Grill In The Park at the Worsley Marriott Hotel and Country Club. 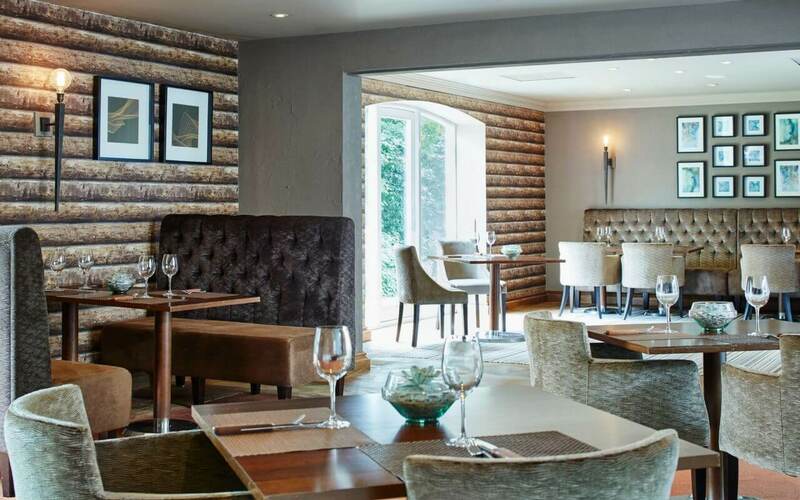 The restaurant has recently undergone a major refurbishment and a complete overhaul of its menu. So I took my teenage daughter along to see what there was to offer there. Because I have travelled quite a lot over the past few years I’ve gotten used to hotel dinners. Week nights in a chain hotel restaurant usually consists of lots of people sat on their own eating dinner in a dull atmosphere eating bland food. With none descript background music and diners sat fidgeting, looking at their phones, notes, newspapers, anything to avoid eye contact with other diners. It’s very rarely pleasant. 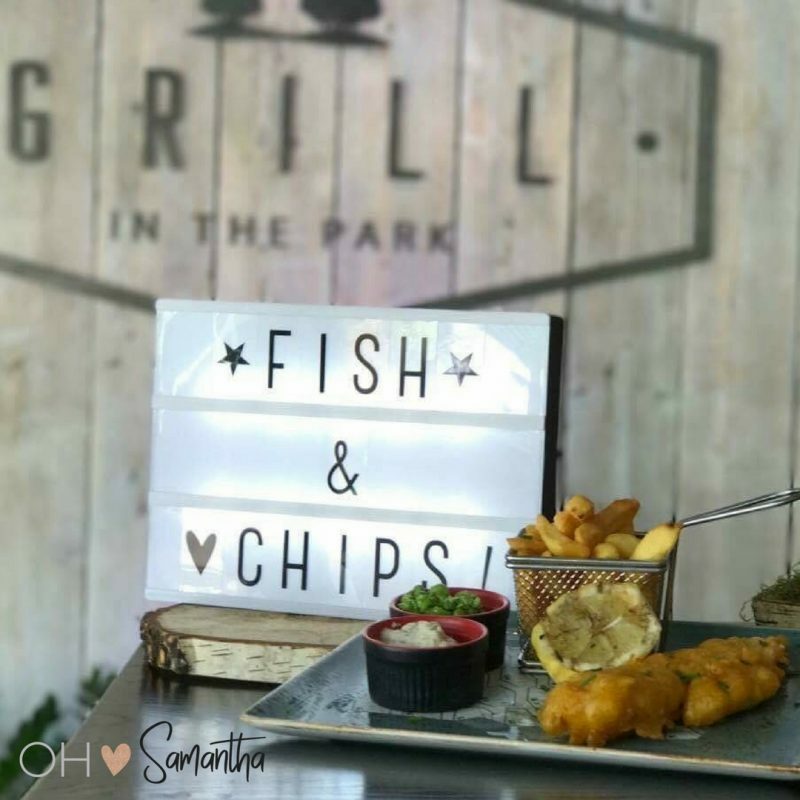 The Grill In The Park has recently undergone a major refurbishment. It’s no longer just another hotel restaurant and now it’s more homely with plusher furnishings and chic restaurant vibe. I also noticed how busy it was for a week night. There was a buzz about the place, helped by the venue having entertainment on in the form of local singer Jack Woodward. He was very good by the way without being over powering and too noisy. It gave you the impression that you would go there for dinner with friends even if you weren’t staying there. The bar area and extensive cocktail menu help with this too. We began our evening with a cocktail master class. I’m sure I provided some of the nights’ entertainment when I demonstrated what we’d learnt from the great barmen. 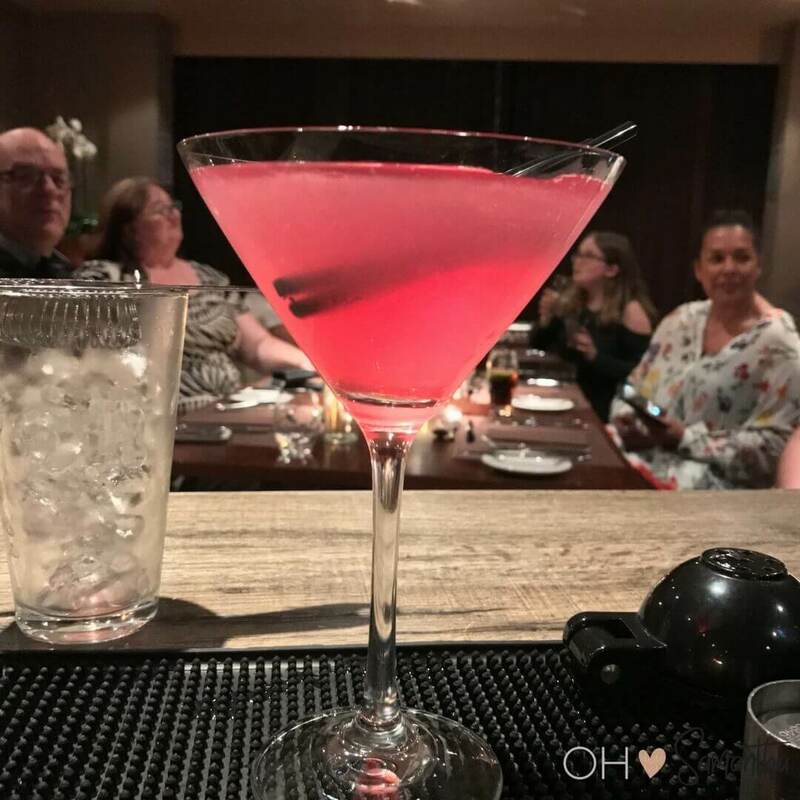 They plan to offer cocktail master classes as part of a package, which would be great for like a birthday or hen party event. As there is also a private dining area your party can be contained without having everyone in the restaurant watching you make your tipples. It took us a while to decide what to have. The menu isn’t huge but there are so many great choices on there so it’s difficult to decide. Even with a fussy teenager in tow! To start with there’s a great range of sharing plates and breads and the firm favourites of soup, prawns, chicken, and fishcakes. 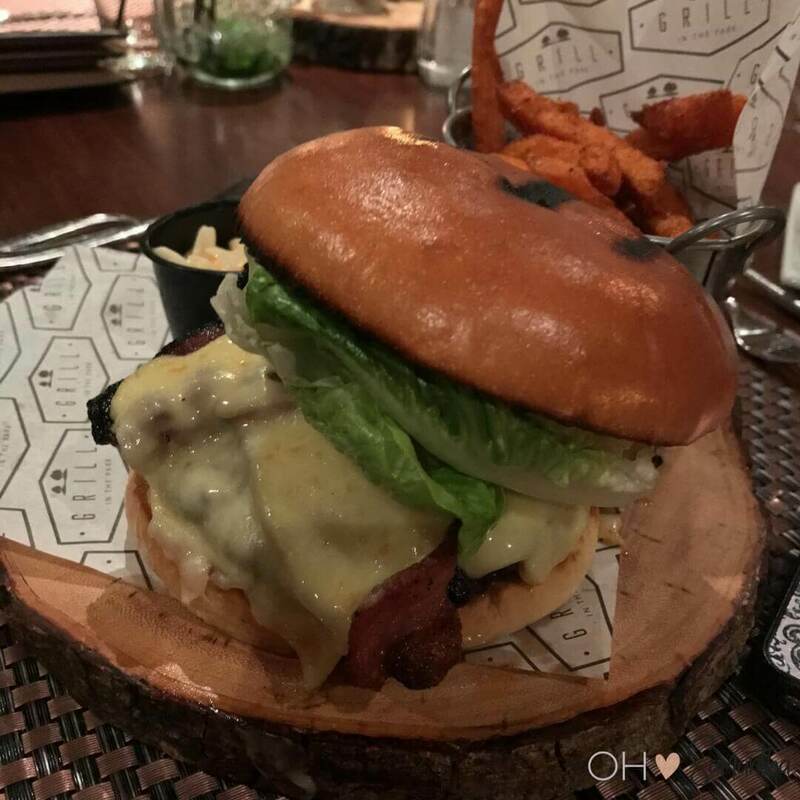 For main courses, there are all the greats of ribs, burgers, steaks, seafood, pasta, fajitas and salads. 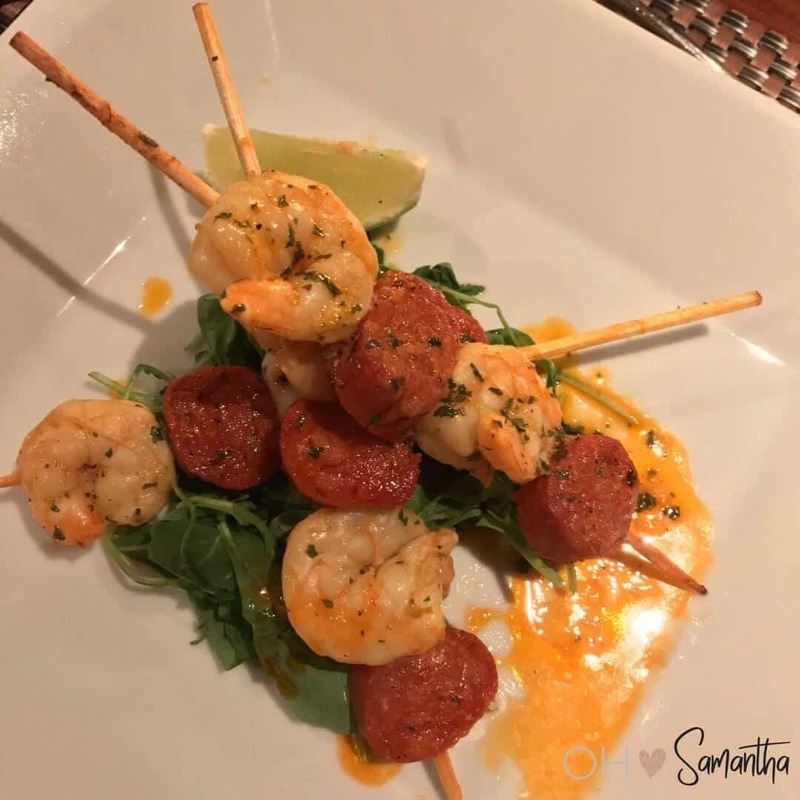 I opted for the Grilled King Prawns to start with that came with chorizo, lemon, and coriander. The teen went for the garlic bread. 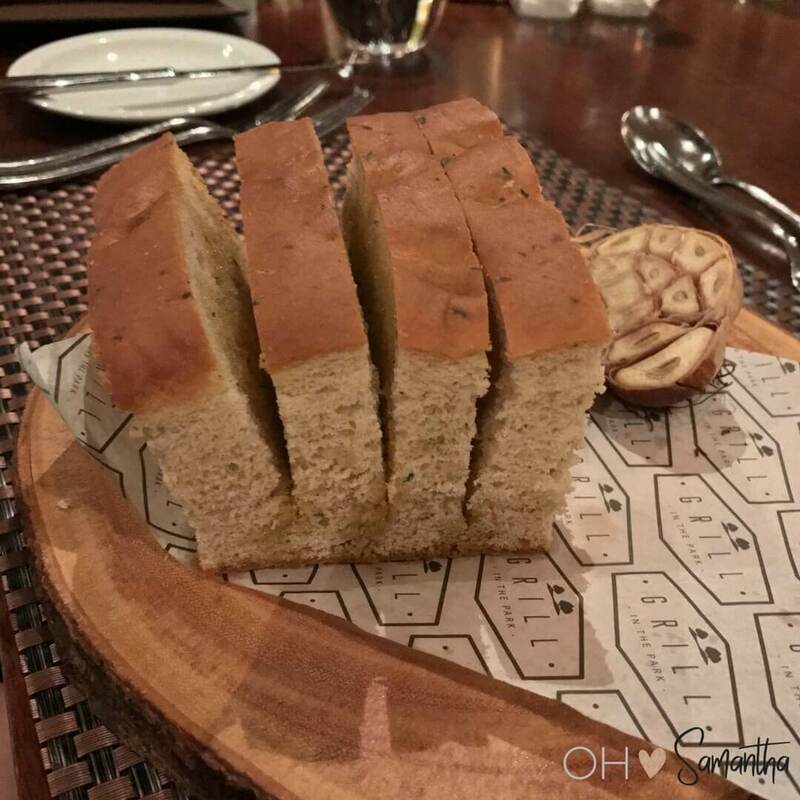 It was quite literally a whole loaf of bread! Both were yummy. 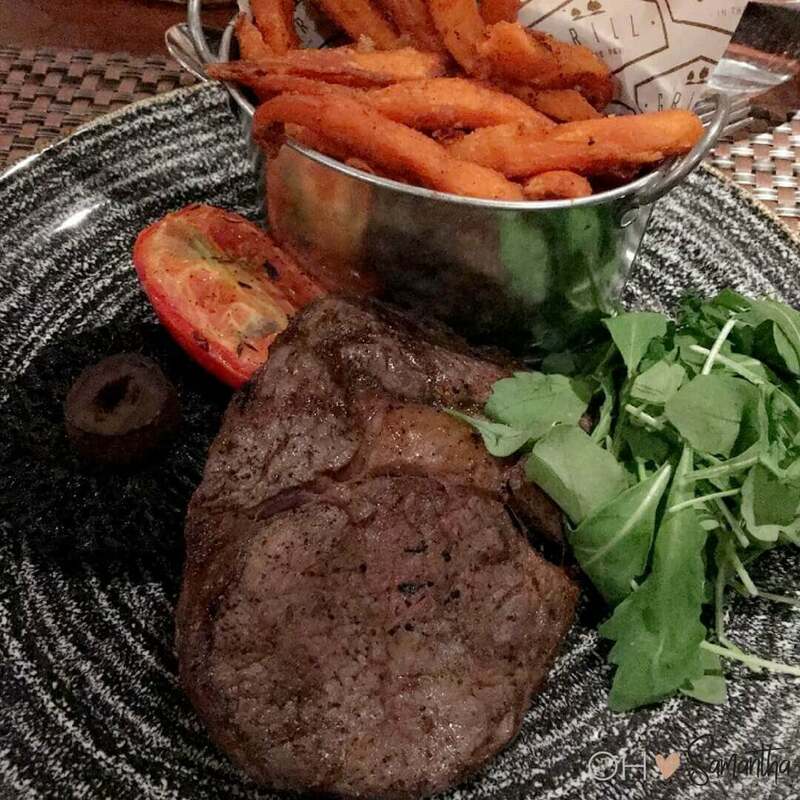 For mains I went for the Ribeye Steak, cooked medium rare served with sweet potato fries. It was cooked to perfection and a really gorgeous cut of meat. I always think a restaurant can be judged by the quality of its steak and his was a good steak. The teen went for the signature burger. It was fully loaded, huge and came with a delicious side of sweet potato fries. My huge appetite but fussy eating teen was impressed. 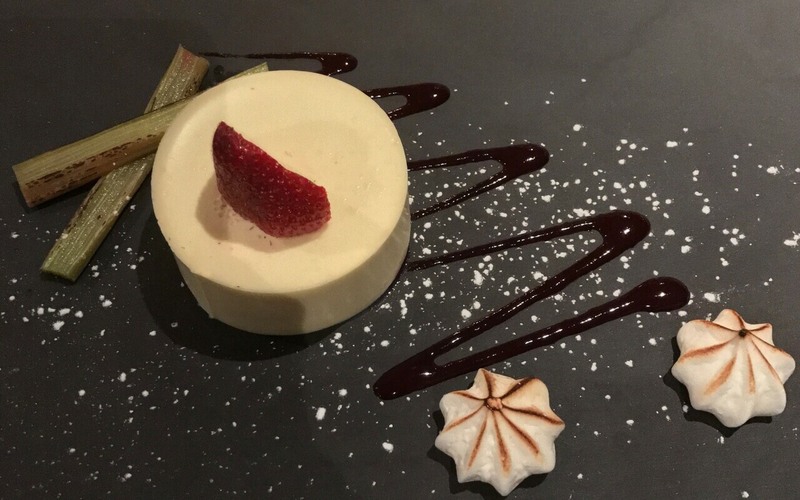 To finish, because you always must do the dessert, I went for the Lemon Panna Cotta, served with roasted rhubarb and toasted meringue. The teen had the ridiculous large Raspberry Ripple Sundae. It was more like a treasure hunt in a container and she didn’t make it to the end. She was officially well and truly stuffed! All the food was absolutely gorgeous. Our fellow blogging diners all also enjoyed their food. A huge thank to Worsley Marriott for inviting me along. I really enjoyed this meal. The food was great, the venue is great and our host for the evening, Jonathon looked after us really well. I will certainly be paying a visit again soon. 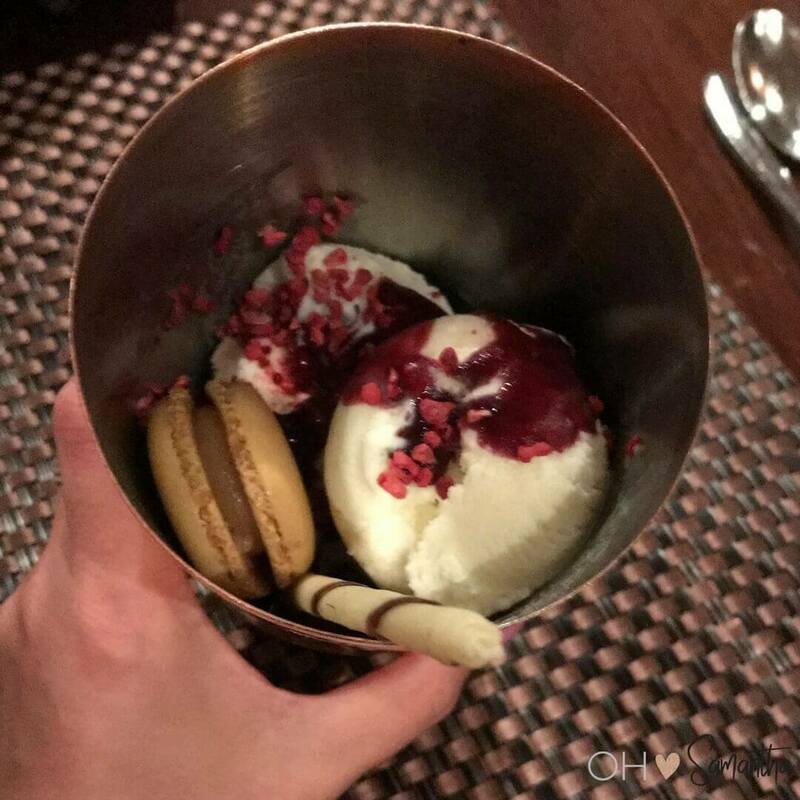 And just on a side note, I had to include this photo of the Chocolate Pot dessert one of the other bloggers had. 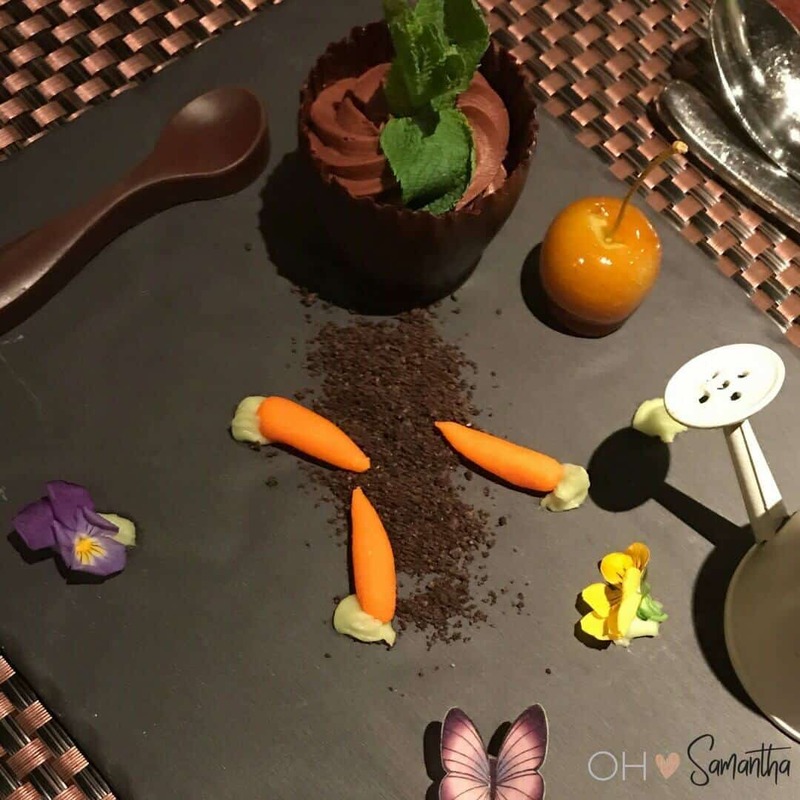 Everything is chocolate! It looked amazing and she did say it tasted fantastic too. 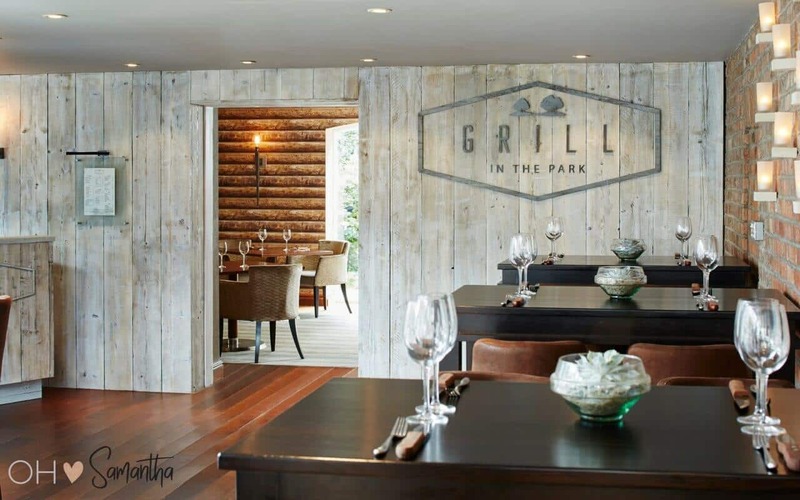 Whether it’s a special occasion, a night with friends, a business dinner or cocktails and steaks for your hen party you will love Grill In The Park at Worsley Marriott Hotel and Country Club. 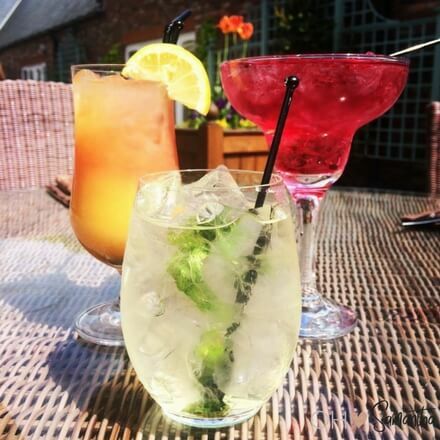 You can find out more about the venue here or click the button above to book your table online.